"Asteroid Coaster" redirects here. For the DS version of the stage, see Asteroid Coaster (DS). 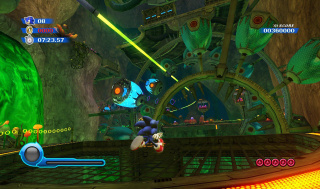 Asteroid Coaster is the sixth stage of Sonic Colours for the Wii. It is an asteroid field with toxic green acid pools and several anti-gravity sections. Moto Bugs and Spinies make their appearance here. The roller coaster itself runs along outside of the main factory area where capsules are held. Sonic finds the planet where Wisps are converted into Nega Wisps and sets off to destroy the generator. Meanwhile, Tails hasn't seen Yacker in a while and begins to worry. After shutting down the plant, the Wisps are freed and Sonic and Tails head back to Tropical Resort to celebrate. Asteroid Coaster Act 1 features roller coasters that Sonic can jump in and out of, and introduces the Purple Wisp, which can break through barriers and heavy blocks. Close to the end of the act, there is a short 2D section that features anti-gravity platforms. Asteroid Coaster Act 2 starts out with a series of platforms suspended above a bottomless pit. Some platforms have walls behind them that will push Sonic off after a period of time, and others will vanish shortly after being landed on. The end of the act is marked by another 2D platforming section, this time with both anti-gravity areas and more moving walls. Asteroid Coaster Act 3 features some 2D puzzle-platforming that requires Sonic to move away from the goal ring, which is located below the entrance, and locate the Blue and Pink Wisps necessary to go back and reach it. Asteroid Coaster Act 4 consists entirely of a long stretch around a planet's rings where Sonic is surrounded by Moto Bugs. Players must use their reflexes to collect the Red Star Rings and defeat as many Moto Bugs as possible to achieve a high score. This page was last edited on 6 March 2018, at 07:56.